Protesters in Seoul demonstrate against a group of asylum seekers from Yemen, on June 30. Hundreds of asylum seekers from Yemen have arrived in South Korea's southern resort island of Jeju. Ebrahim Qaid, right, is one of more than 500 Yemenis who arrived this spring in Jeju. He found work on a fishing boat in Hallim port. Residents of Jeju island take part in one of the country's protests against acceptance of Yemeni refugees. A larger protest took place last weekend in Seoul. 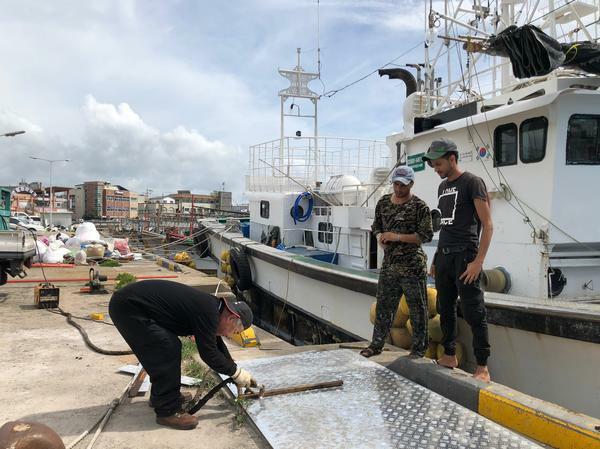 Qaid found work on a 29-ton boat in Hallim port, on Jeju's northwestern shore. He's taken to calling his Korean boss abogee, a term of endearment in Korean meaning "dad." "I was a student in Yemen," Qaid says. "But because [of] the war, I need to work, help my family in Yemen." His work is helping abogee weld floorboards and make fixes before the ship heads back out to sea in a month. He and other Yemenis are doing the kind of jobs most Koreans don't want. "In Yemen, [we] don't have work, don't have anything. Don't have hospital, don't have lights. Four years, don't have lights," Qaid says. The United Nations High Commissioner for Human Rights estimates that between March 2015 and August 2017, the war in Yemen killed more than 5,100 civilians and injured more than 8,700. The country is teetering on the brink of famine. The U.N. has called it "the worst man-made humanitarian crisis of our time." Omar Al-wahaishi, another Yemeni in Jeju, says young men are being forced to choose sides and become conscripts. To avoid that, he fled. "We refuse this kind of politics. We will not go fight, we don't want to fight," he says. "So if I go back to my city directly, I will be imprisoned or maybe executed. It's the same fate. Because if I go to prison, I will not get out." If going home is not an option, staying in Jeju may not be possible either. The influx of Yemenis has thrown ill-prepared South Korea into a national debate over its responsibility in the global migration crisis. "Citizens come first, we want safety," a crowd of nearly 1,000 chanted in the streets of Seoul last Saturday during a rally against refugees. Protesters held up signs calling Yemenis "FAKE refugees." According to South Korea's justice ministry, last year the country approved 91 out of 6,015 refugee claims, or about 1.5 percent. But demonstrators say that's still too much. "They came here without proper legal process," says demonstrator Christopher Han. "We are in the position to help them. But the truth is that, the reality is that we have been used by them." The main fears are over safety, Han says. "It is all about their different idea and belief system. I mean the Muslims," he says. On June 1, President Moon Jae-in's government ended visa-free entry for anyone from Yemen, effectively closing the border to Yemeni refugees. Most of the Yemenis already on Jeju are blocked from leaving the island. Even so, the backlash appears to be growing. More than half a million South Koreans have signed a petition asking the government to turn away refugees. 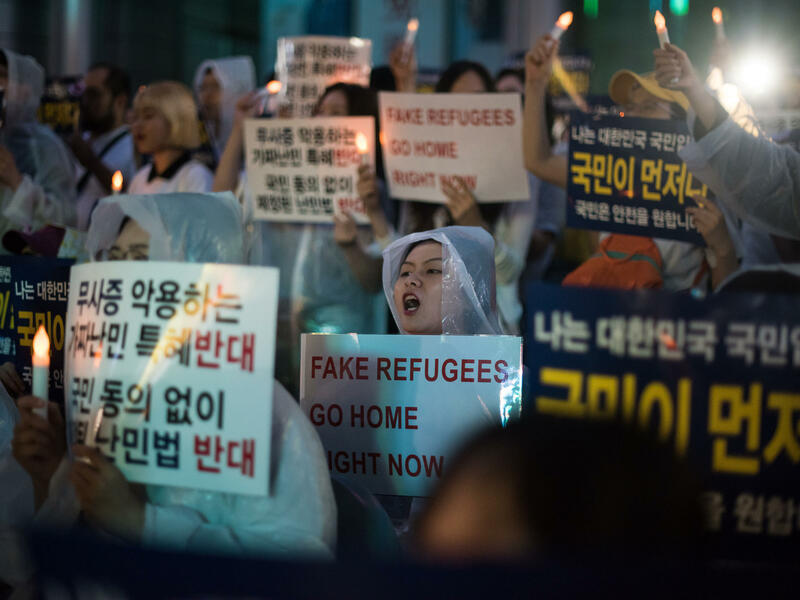 "I didn't expect Korea to welcome refugees with open arms," says Sharon Yoon, a professor of Korean Studies at Seoul's Ewha University. She's not surprised since non-native Koreans make up only 4 percent of the country's population. Until 2007, the country's education system taught students it was ethnically homogeneous — a single-blooded nation. South Korea is not alone in its reaction to refugees, Yoon notes. "Yes," she says, "there is a lot of pushback, and yes, there is a lot of pressure from civil society, but xenophobia is not the whole picture. There is a backlash over accepting refugees all over the world. And Korea is one of those countries." On Jeju, some Korean employers, like fishing boat owner Lee Si-hyun, take a "why not" attitude to giving Yemenis work. "If they're willing to head out to sea, I'll keep employing them," he says. Omar Al-wahaishi says he's encountered only kindness from Koreans. "I want to give them the message that we are ordinary people. We want to live in peace. We want to [live] in safe[ty]. We don't want to cause any problems for anybody," he says. His future, and that of more than 500 others, is now in the hands of the Korean government. 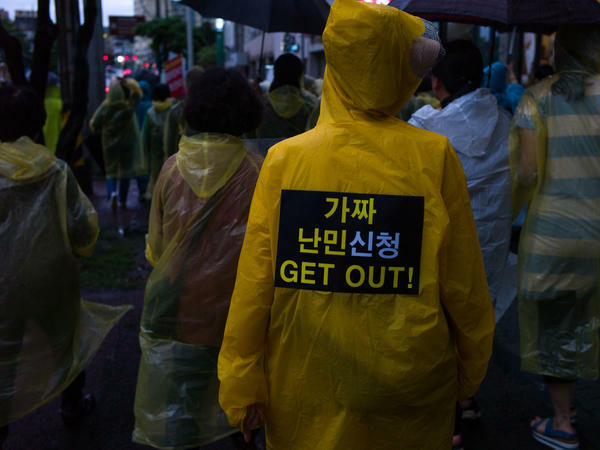 South Korea's asylum decisions are expected within six months. "The unknown. The limbo," Al-wahaishi says. "That's what's scared us the most." NPR news assistant Se Eun Gong contributed to this story from Jeju and Seoul. More than 500 refugees from war-torn Yemen have found themselves in an unlikely place - the tiny resort island of Jeju in South Korea. The Yemenis are hoping for asylum to stay there. But as they wait, they're catching backlash from South Koreans. NPR's Elise Hu has this story from Jeju. HU: ...Ebrahim Qaid kind calls his Korean boss aboji, or dad. It's a term of endearment in Korean. QAID: I love Korea. I love Korea, really. HU: Qaid found work on this 29-ton boat welding floorboards and making fixes before the ship heads back out to sea. He's doing the kind of jobs most Koreans don't want. QAID: I was student in Yemen. But because of the war, I need to work for - help my family in Yemen. HU: He is one of the 561 Yemenis who arrived here since January, thanks to Jeju's policy of allowing foreign nationals to enter without having a visa in advance. They were fleeing a four-year war with no end in sight. QAID: Because in Yemen, don't have war, don't have anything. Don't have light, don't have hospital. QAID: No lights. For four years, don't have light. HU: The ongoing civil war has taken out more than infrastructure. It's killed thousands of civilians. And Yemen is teetering on the brink of famine. Another Yemeni in Jeju, Omar al-Wahaishi, she, says young men are being forced to choose sides and become conscripts. To avoid that, he fled. OMAR AL-WAHAISHI: We said, we refuse this kind of politics, that we will not go fight. We don't want to fight. And so if I go back to my city directly, I will be imprisoned or maybe executed. It's same fate because if I go to prison, I will not get out. HU: He can't go home, but he and others may not get to stay, either. UNIDENTIFIED PERSON: (Chanting in Korean). UNIDENTIFIED CROWD: (Chanting in Korean). HU: "Citizens come first. We want safety," crowds chanted in the streets of Seoul Saturday. Some 1,000 demonstrators showed up to rally against the influx of Yemenis. Their arrival threw South Korea into a national debate over its responsibility in the global migration crisis. CHRISTOPHER HAN: They came here without proper legal, you know, process. HU: Demonstrator Christopher Han says too many foreigners are getting in. HAN: We are in a position to help them. But the truth is that - the reality is that we have been used by them. HU: Protesters held up signs saying get out and calling the Yemenis fake refugees. Han says his top concern is violence against locals. HAN: But it is all about their different idea and belief system. I mean, they're Muslims - different idea and different belief system. HU: On June 1, South Korean president Moon Jae-in's government ended the visa-free entrance policy for anyone from Yemen, effectively closing the border to Yemeni refugees. The ones already here are blocked from leaving Jeju Island. And half a million Koreans have signed a petition asking the Moon government to turn away refugees by changing policy. SHARON YOON: I didn't expect Korea to welcome refugees with open arms, right? HU: Sharon Yoon is a professor of Korean Studies at Seoul's Ehwa University. She's not surprised, as South Korea is 96 percent native Korean. Until 2007, the education system taught students it was ethnically homogenous, a single-blooded nation. YOON: Yes, there is a lot of pushback. But civil society and xenophobia is not the whole picture. The sense that, like, there is a backlash of accepting refugees all over the world - and Korea is one of those countries. HU: On Jeju, some Korean employers, like fishing boat owner Lee Shee-hyun, take a why-not attitude to giving Yemenis work. HU: "If they're willing to head out to sea, I'll keep employing them," he tells us. WAHAISHI: I want to give them the message that we are ordinary people. We want to live in peace. We want to live in - safe. And we don't want to cause any problem for anybody. So I hope they understand that we are a peaceful people. HU: He's now 5,000 miles away from war. His fate, like the 500 others, is in the hands of the Korean government. Elise Hu, NPR News, Jeju, South Korea. Transcript provided by NPR, Copyright NPR.